BILOZERKA, Ukraine — It’s an early Saturday afternoon, and almost no personnel are left on duty at the Bilozerka village hospital in the southern Kherson region of Ukraine, not far from Russia-occupied Crimea. Patients are forced to shell out for everything from hospital stays to soap. I’m advised to hurry if I want to try to catch the specialist I’m looking for. If I’m lucky, he won’t have left yet. Ukraine has more doctors per capita than many European countries, but most state medical centers empty out on the weekends. Instead, in an unlighted corridor, I meet a man in his thirties named Vitaliy, who is there with his mother and sister to visit his father. All three are wearing blue scrunchies over their boots. They suggest I buy the same in the pharmacy across the road. You can’t visit a patient here without them. “It is so expensive to get treatment,” complains Vitaliy. 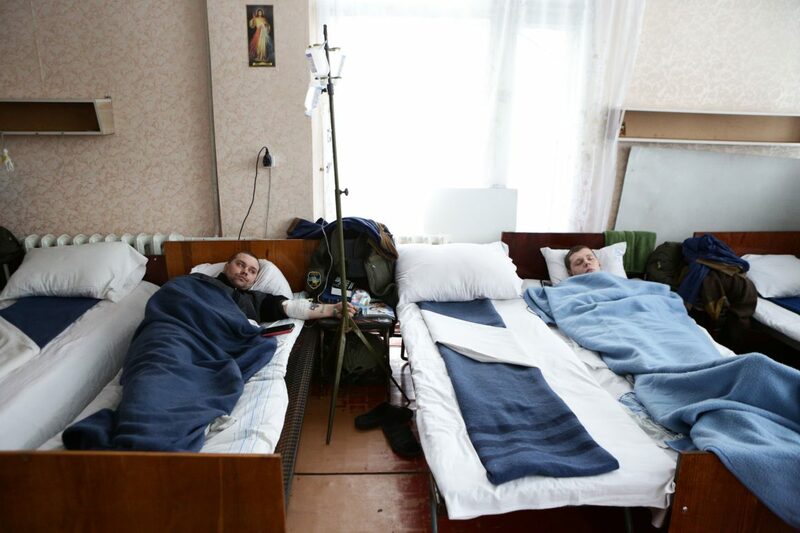 By law, Ukrainian health care is free. But in reality, patients end up paying for almost everything: drugs, examinations, doctors’ time, hospital stays — even sundries like washing powder, soap and paper towels. Vitaliy’s father has been told he will have to stay for at least 10 days. By the numbers, Ukraine’s free health care system looks great. The country has 4.4 doctors and 7.8 hospital beds per 1,000 people, more than most European countries. In reality, its system is underfunded, corrupt and inaccessible. According to recent polls, more than 90 percent of Ukrainians were unable to afford treatment because of high prices. Even doctors are afraid of not being able to pay for medical expenses if their relatives fall ill. The majority of Ukrainian doctors are poor. Though 60 percent of the national budget for health care is allocated to salaries, doctors are grossly underpaid. An experienced professional is paid only slightly more than $100 per month. I know because both of my parents are doctors. My mother specialized in neonatology, the medical care of newborn infants. My father carried out autopsies. As young students, they dreamed of a prestigious career in medicine, and easily found jobs in Kherson based on their credentials. Like many of their peers, they thought that if they worked hard and scrupulously, they would be rewarded. The collapse of the USSR turned their personal and professional lives upside down. In the 1990s, it wasn’t enough to do your job, you had to know how to cheat and steal. My parents, two educated doctors, struggled to put food on the table for their children. My family survived thanks to my grandparents, who supplied us with vegetables, chickens and eggs from the countryside. With every new president, every new minister, they hoped conditions would improve. Then, they turned 50, and they stopped hoping. None of the dozens of Ukrainian medical professionals I spoke to in Kherson pretended that a system of “nonofficial payments” did not exist. As everyone here knows, it is the only way for Ukrainian medicine to stay afloat. “More and more, there are patients in severe stages of diseases because they came too late,” one doctor told me, asking to remain anonymous. “The reason that there is a problem in [the] health care system in Ukraine is because for 70 years of communism and 25 years of independence nothing was done to make it better,” Uliana Suprun, Ukraine’s health minister, said in an interview. The country’s health care system seems to be so difficult that the government tends to turn to outsiders to try to change it. An American by birth, Suprun took over the ministry from a Georgian predecessor. Wearing a plain black fleece jacket over a T-shirt and no makeup, Suprun strikes a different chord from the first woman to lead the ministry, Raisa Bohatyrova, who was known for her love of the luxury brand Louis Vuitton and was accused of embezzling some $42 million under Viktor Yanukovych’s pre-revolutionary government. Suprun entered the ministry in the summer of 2016. During the Euromaidan revolution and the military conflict in Donbass, Suprun worked with NGOs to provide soldiers with first-aid kits and training, and earned the trust of Ukraine’s international supporters, such as UNICEF and the World Bank, as a reformer. But earning the trust of common Ukrainians will likely be much more challenging. People have heard about the poor state of the health care system from every successive minister. Suprun is the 22nd health minister in 25 years of independence, and they’ve long ceased to pay much attention to who occupies the office. Those who are paying attention in Kherson are broadly skeptical of the American reformer. Nostalgia for the Soviet system has been always more present here than in other parts of the country, and Kherson has become even more susceptible to Russian propaganda after Moscow’s annexation of Crimea in 2014. Investors, scared of Putin’s appetites and unpredictability, have tactfully avoided Kherson. The region’s industries have died and the national government seems to have forgotten about many of its development projects there. The whole economy is desperate, and political mistrust has fomented passivity and skepticism. Those who want change are often resistant to taking on the responsibility. In fine Soviet tradition, they separate themselves from the abstract authority responsible for all the misfortune. Kherson’s doctors are largely on board with Suprun’s proposed health care reforms. But political populism, a corrupt opposition and widespread mistrust of authority have led many to misinterpret her proposals. Doctors say they want insurance and higher salaries, but they are afraid of changing the financial system. They want to provide better treatment but are wary of having to implement international standards. Suprun’s proposal to merge hospitals that serve fewer than 100 patients a year — a measure that would allow doctors to provide 24/7 care but still take days off — was interpreted by medical personnel as a move to close hospitals, and many are afraid of losing their jobs or having to commute on bad roads. The region’s medical professionals, lacking international experience, often struggle to point to solutions themselves. Suprun has no option but to move forward and hope doctors in places like Kherson will follow her, she said. “What we’d like to do is to make a comprehensive change of the system … to actually organize it in such a way that we know where the financing is going, we raise the quality of care and we provide the services that are necessary,” Suprun said. The first visible changes are set to be implemented in April — the same month the current government’s one-year immunity is set to end. In Ukraine’s volatile political system, which saw three governments in the past three years, this immunity protected current ministers from change for a one-year period. The position of health minister is a coveted prize in the holy war of Ukrainian politics and there is a high chance Suprun will soon be replaced by someone else, who will likely start the process of health care reform again from scratch. Asked about the possibility of being replaced, Suprun looked tired. Still, she is hopeful her work will be a strong basis for a successor to keep reforms on track, she insisted. Whatever happens, for the time being, not much will change for the doctors at the village hospital in Bilozerka.